A tunnel is an underground passageway, dug through the surrounding soil/earth/rock and ... A major tunnel project must start with a comprehensive investigation of ground conditions by collecting ..... which originates in Amsterdam, through the city; and the two upper tubes take the N2 regional highway for local traffic. - Ooty is well connected by good roads. It is 535 km from Chennai (via Salem), 88 km from Coimbatore, 18 km from Coonoor, 155 km from Mysore (via Gudalur), 187 km from Calicut, 290 km from Bangalore, 281 km from Kochi (via Coimbatore and Palakkadu), 236 km from Kodaikanal (via Coimbatore and Palani). Chaitanya Projects Consultancy Pvt Ltd. 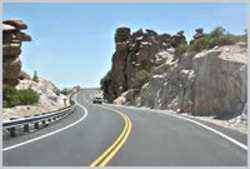 Roads & Highways Group has vast experience in designing the various types of roads such as Rural, Urban and Hill roads, Highways & Expressways. It also has considerable expertise in the development of internal roads within industrial/ residential townships, Airports, Sea ports etc. We provide various field and laboratory testing for tranportation engineering. These services facilitate for design of pavements, highways and bridges. We are one of the leading Asphalt & Cement Road Construction Contractor having presence all over Maharashtra.NOTE:- Minimum area of construction should be 5000 sqm.